Colombian cycling hits the crest of a wave this week, one which began nearly a decade ago, with an all-star cast for the second edition of a new-look Colombian tour starting Tuesday in Medellin. Headliner Chris Froome (Sky) makes his season debut at the Colombia 2.1 in what is a tip of his yellow hat to how far Colombian cycling has come and how deep fan interest is. But it’s the Colombian riders who will be the stars of this show. Nearly all of today’s Colombian stars will be lining up for a six-day stage race. Some hope it can grow into a WorldTour event and help cement Colombia’s place in the peloton. Others joining Quintana include Rigoberto Urán (EF Education First), Egan Bernal (Sky), Fernando Gaviria and Sergio Henao (UAE Team Emirates) and Miguel Angel Lopez (Astana). The expectations couldn’t be higher in a nation that’s crazy about cycling. A new generation of riders is already making an impact across the world’s most important races, but this week marks a chance for local fans to see their two-wheeled heroes in action. More than 20,000 fans packed into a soccer stadium Sunday night for an emotional team presentation. The race is set across the region in and around Medellín, home to such riders as Urán, Gaviria, and Henao. It opens with a team time trial Tuesday and features a few sprint opportunities for Gaviria. The overall will be decided in two climbing stages, including the race-breaker at the Alto de Palmas in stage 6 Sunday. The race should be a good warm-up for Tour de France riders, who will be facing a lot of altitude in this year’s edition. Four of the six stages this week are held on roads higher than 2,000 meters in altitude. The scene should be over the top. Fans turned out in force for a team presentation Sunday evening. Huge crowds are expected along the route for each day’s stage. Last year, fans surrounded team buses and chanted riders’ names. Stars like Quintana and Urán were mobbed wherever they went. Dubbed Colombia 2.1, the race picks up where the Oro y Paz race left things last year in an exciting debut edition that saw Bernal take an impressive first win in Sky colors. That helped pave the way for Bernal’s spectacular season capped by his selection to the Tour de France. Bernal is back, along with four-time Tour winner Froome making his season debut on Colombian roads. Other top pros include Bob Jungels and Julian Alaphilippe (Deceuninck-Quick-Step), Marc Soler (Movistar) along with a big fleet of “Norteamericanos,” including the Aevolo, Hagens Berman Axeon, and Illuminate teams as well as EF’s Lawson Craddock, Taylor Phinney, Nate Brown, and Alex Howes. 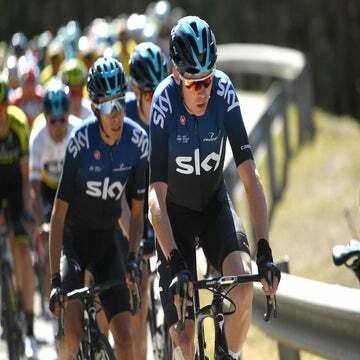 Froome has used the race to not only make a season debut but also to train at altitude for the past two weeks. Froome visited Colombia last year at the invitation of Urán, and jumped at the chance to race in Colombia this year. Froome’s welcome will likely end, at least among his rivals, as soon as the roads tilt up.